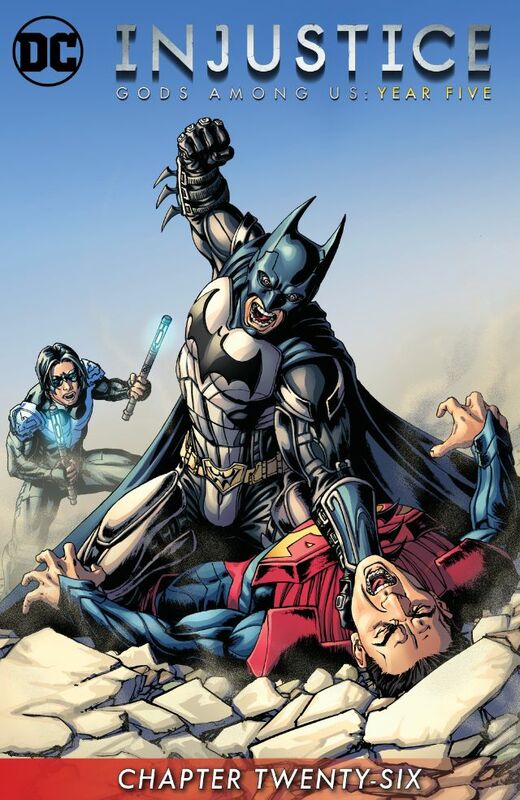 The Justice League arrive and defeat Batman. However, The Flash spirits Batman away so he can give Alfred a proper funeral. Batman suggests to Flash that the only way to solve the situation of the Regime, is for Flash to go back in time and stop the events that led to Regime Superman's origin. Flash says he'll consider it, Bruce Wayne gives Alfred a right burial. Story - 1: Wait. What? The Flash is going to go back in time and change history? While he does that, can he go back in time so I never had to waste my time with this talent-forsaken series? For years I heard the cheap critique for Superman: The Movie, and Superman going back in time to reverse the damage that was done. The large part of the critique being: "Why didn't he just do that before?" The same would apply here, for after five years of death and mayhem, why didn't the Flash just change things up? Mind you, every hero that goes back and changes the timeline mucks it up. Green Lantern, as Parallax, did so and we received Zero Hour. Flash did so, and we were rewarded with Flashpoint Paradox. Booster Gold... too many to list. In fact, the only hero to travel through time and not make a mess was Superman (and Clark Kent Superboy). Superman's ability to travel through time was taken away as it was thought to make him too powerful, to unbelievable. Do you believe it now? What should have been a poignant issue in remembrance of Alfred Pennyworth, is merely more set-up for Injustice 2. Art - 3: Serviceable and flat. There's little new action to play with here, so it's more punching, bloody faces, and grimaces, and nothing to become excited by.